Through the friendly cooperation of its owner we received a copy of the recording, which Kristian Krogholm rapidly identified as part of 43.03 in Harald Henrysson’s list of all Jussi’s recordings. On 1o July 1943 he sang three numbers with the Stockholm Radio Orchestra and Sixten Ehrling at the concert hall of the Music Academy in Stockholm. They were not meant for Sweden. Rather, in the midst of wartime the Swedish Radio (then “Radiotjänst”) produced a series of 15-minute transmissions to USA of which this was the final one. It seems they were broadcast over some twenty stations, particularly in those states where many Swedes had settled. 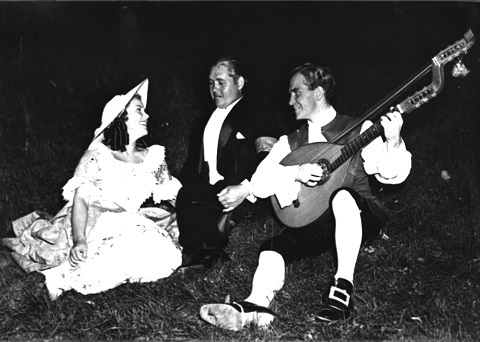 Jussi was by this time widely known in the US, which he had left in spring 1941 with the intention to return for next autumn’s Met season. Instead he had now been 2½ years in Sweden, if we except shorter guest appearances in Copenhagen, Helsinki, Budapest and Firenze. That he was in heavy demand is not surprising; today we may find it stranger to undertake these travels during wartime. He also sang at many concerts around Sweden and of course at the Royal Opera in Stockholm. He also performed for soldiers as a ‘field artist’. The present version of ”Nessun dorma” is Jussi’s earliest recording of the aria. Stephen Hastings in his The Björling Sound, where he surveys almost all Jussi’s recordings, has quite a lot to say about it. It contains some wrong pronunciations of the Italian text which may indicate that he had learnt it recently. He probably saw the opera in Stockholm during his apprentice years 1928-29 or when the production was revived for a few performances in October-November 1937. Then the aria was sung in Swedish by Einar Beyron, whom we also can hear on a gramophone record. Jussi’s own first official recording of the aria is from March 1944, that is eight months after the version we discuss here. In his later recordings the pronunciation is corrected and the high note near the end of the aria becomes longer, sometimes sensationally long. This is notable as this B in the score is just an accented eighth note (quaver) with no indication that it should be extended, quite similar to the one the chorus sings to the same tune at the end of the opera (in the most common ending, which of course is Franco Alfano’s work after the death of Puccini who never completed his Turandot). Only in some of the very earliest recordings of the aria, directly after the premiere in 1926, a few tenors resist this temptation. Hastings calls this 1943 version masterly and says that ”one is struck by the breadth and beauty of a performance that unfolds with contemplative ease”. The score says Andante sostenuto, but Hastings finds all Björling’s versions slower. He emphasizes how the sound is homogenous between high and low notes – a virtue prized by bel canto theorists of the eighteenth and nineteenth century. We hear “the ardently lyrical tone of a young man in love: there is caress, not scorn in his voice as he imagines Turandot in her ‘fredda stanza’ [cold chamber].” “Fredda” is among the words which Björling elongates somewhat. Among these are also the B mentioned previously. 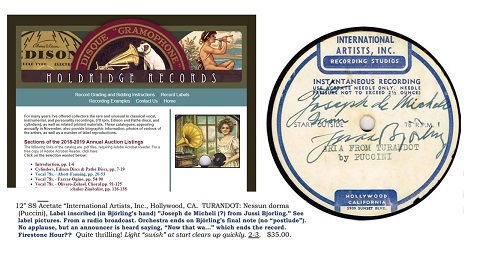 The auction finished with a price of slightly over eighty dollars for the record. Even if the recording as such did not prove unique, and even was transferred onto CD (Bluebell 103), this copy is a special one. Evidently some technician in California recorded it, probably off the air, and its sound may be better than the few originals available previously. Such studios were consulted by artists who wanted to hear their broadcasts, but here it seems more likely that the disc was made for the person to whom Jussi wrote his autograph, and that he asked Jussi for it at a later time. Or can Jussi have had some copies made to use as gifts? That seems less likely, particularly as that could not have happened until two years after the recording when Jussi was back in the USA. 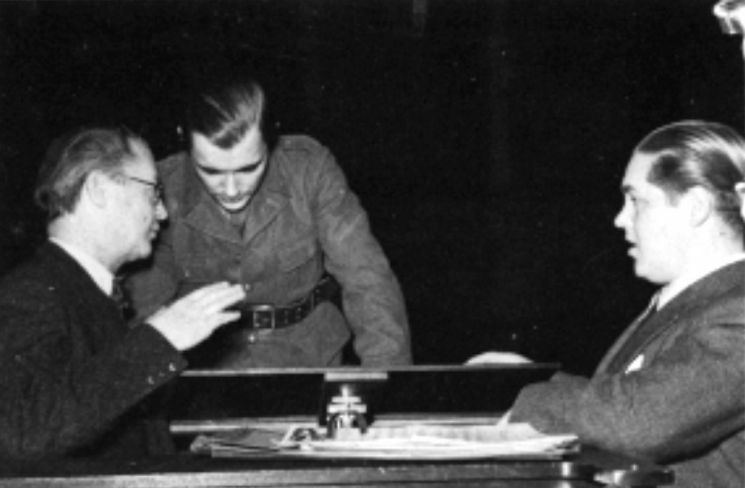 The recording will have been played on American radio stations rather immediately in 1943. Someone may have had it recorded for his collection, and then met Jussi in October-November 1945 when he sang in several towns near the American west coast. The 15-minute programme transmitted to the US also contained ”E lucevan le stelle” from Tosca and “Tonerna”. 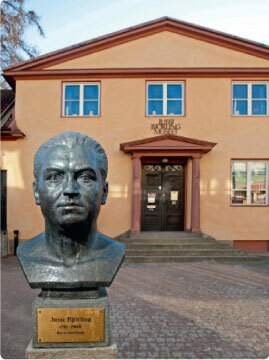 Evidently Jussi interrupted his summer vacations in the Stockholm archipelago that year 1943 for the recording session. He sang at Gröna Lund 30 June and 15 July, and the day following the radio recording he was at Frösön for an outdoor concert. Apart from these four performances we do not find any in Harald Henrysson’s list for the time from Midsummer to 10 August. Then there is again a full schedule. It is five years since he last learnt a new role, and there will be another six until the next one. Only two remain, and Turandot he will sing complete only on records.